The BMW X4 is a sporty five-seat SUV that comes powered by a pair of strong turbocharged 4- and 6-cylinder engines. All-wheel-drive is standard on all versions. 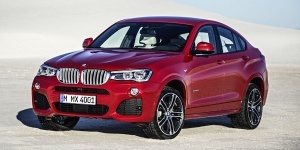 For 2015, the BMW X4 has been introduced as an all-new vehicle. Find the used BMW X4 of your choice from a dealer in your area. Search our used car listings now.